Bikini with your dog can be quite an enjoyable experience. Yes, many dogs like to run alongside you while you ride your bike. However, not all dogs can do that. For starters, some dogs lack the discipline to run alongside your bike. Others, lack the physical ability to do it. That is why bikini with your dog is not always feasible. 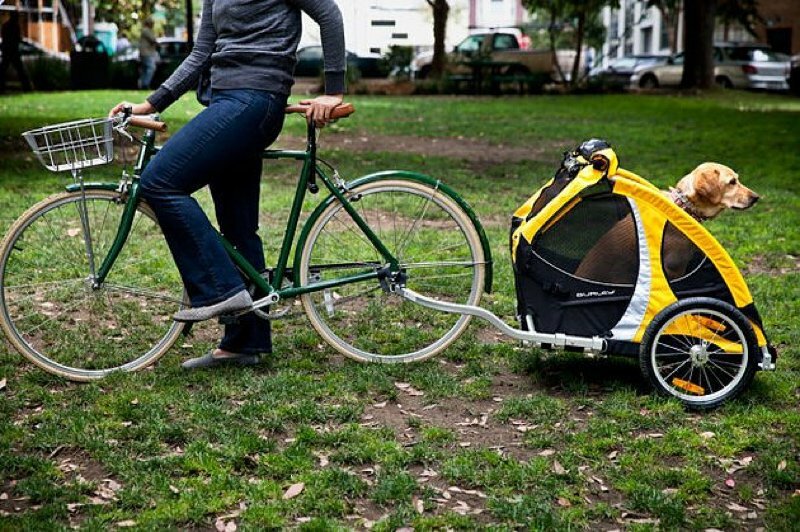 With that in mind, today, we would like to introduce you to the best dog bike trailer, a device you can use to bike with your puppy. Why buy the best dog bike trailer? 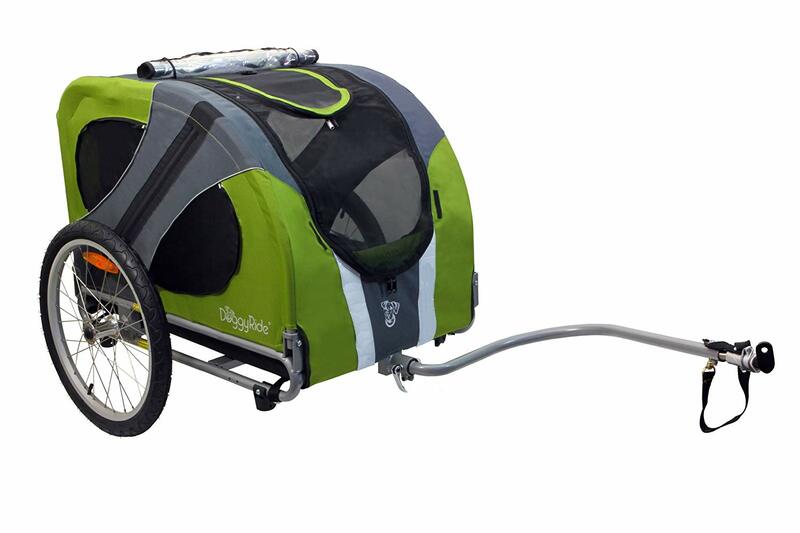 The first question dog owners ask when it comes to dog bike trailers is why they need one. Well you will be surprised how many reasons are there for owning one. 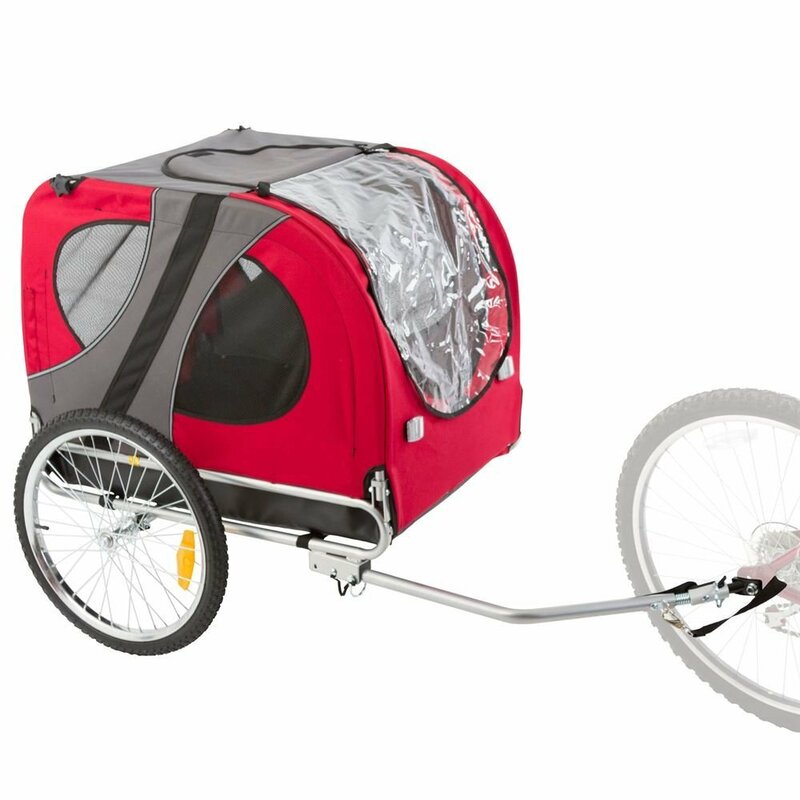 There is a huge difference between the best dog bike trailer, and a decent one. The difference is usually in important features. However, at the end of the day, the most important thing is to purchase a trailer that fits the needs of you and your dog. With that in mind, here are some things to look for in the trailer. If your dog cannot sit and fit inside comfortably, the trailer is useless. Make sure to measure your dog’s length, and then compare to the interior dimensions of the trailer. Check the weight limit as well, especially if your dog weighs more than 40 pounds. This might sound like something trivial, but the connecting hardware is extremely important. Different trailers connect to your bike in a different way. That is why you want to be sure that the trailer you choose is easy to hook up on your bike. If you buy a good build quality trailer, you ensure two things. First, it is much safer for your dog to travel around. And second, the trailer will last longer. Even if a trailer costs more, if the build quality is good, it will last two or three times longer than some cheaper trailer. Of course, you need to consider how much you will use it. If you need a trailer for once every two months, you can probably get away with a lower quality build. The well-designed trailer will make it easier and more fun to use it. And it will keep your puppy safe while you are riding it. Attaching a trailer to your bike can compromise the safety of your ride. Look for a trailer that has multiple axes on the hitch, and fits relatively snuggle against the back wheel. This will provide the best handling and maneuverability of your dog bike trailer. Let’s be honest, the trailer will spend more time in the garage than on the streets. Even if you ride your dog every day, the trailer will spend a lot of time in the garage. This is where storage comes into play. Look for trailers that can be partially collapsed to save space if you are not swimming in storage space. Some bike trailers can be used for other purposes. That increases their overall value. For example, some trailers can be disconnected and converted into a stroller or cart. You can also use the trailer to carry other items. There are different entry points. Some trailers ask for you to load the puppy from the top. Generally speaking, you are better off with a model that allows your dog to enter from the front or side, especially if you have a large dog. If your trailer has exterior pockets, that is a bonus. You can use these pockets to carry keys, food, water bottles, or treats for your dog. Look for pockets that can be zipped or shut securely. 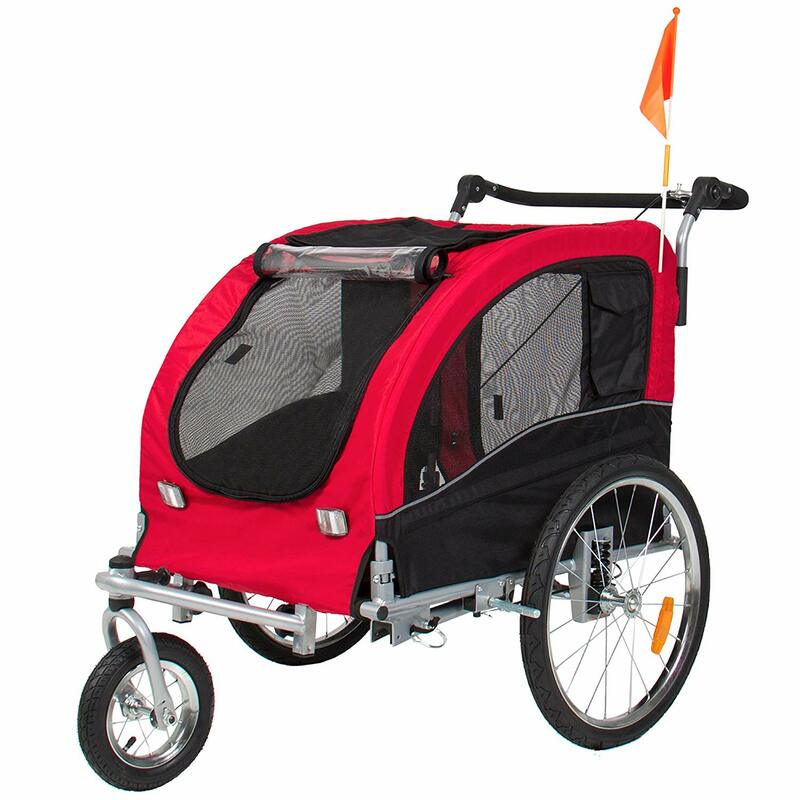 In addition to purchasing the dog bike trailer, you need to make sure you purchase safety equipment as well. After all, the safety of your puppy is a priority. How to introduce your dog to the trailer? Dogs need to be introduced carefully to any new item they will use. Many dogs can be nervous about the idea of riding inside. The best thing you can do is start slowly, and introduce your dog to the trailer gradually. Put the trailer in a quiet room, and let your dog come in, and give the trailer a sniff. Dogs view every device as a potential danger (a vacuum cleaner is at the top). Let your dog approach the trailer on its own. In the same time, give your pet praise and treats as he checks the trailer. Step one is to open up the trailer and encourage your dog to enter it. Do not force your dog to do it. Once your dog is comfortably sitting inside, strap him in and close the trailer. Pull the trailer around by hand to see how he reacts. Keep things slow and gentle. Your dog needs to learn he is in a safe place, and that nothing will happen to him. Dogs can get nervous when they do not see their owner. Once your dog gets comfortable with pulling around, you can start hooking it up to your bike and start with short rides. Just remember not to push it. Some dogs need more time than others to get adjusted to new objects. 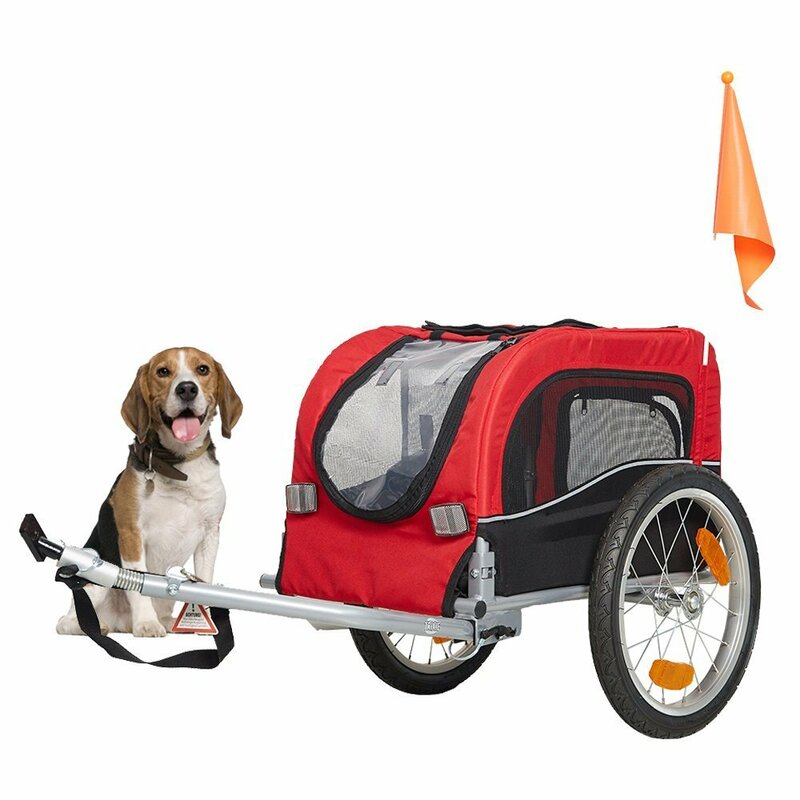 Now that you’ve purchased the dog bike trailer, you’ve introduced it to your dog, and you are ready to go outside, we have to mention a few important things. Take precautions when going outside. For a relatively modest price, you get a trailer that can get the job done perfectly. 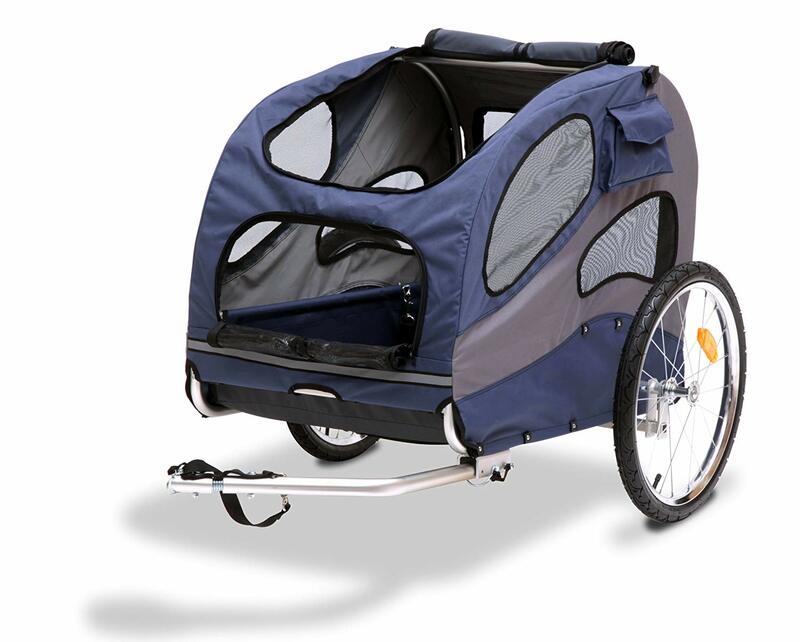 Steel-framed, the Aosom pet trailer is a collapsible bike trailer that will provide your pet a comfortable ride. The outer shell is made of polyester, featuring several large mesh panels that provide your dog fresh air. And of course, your puppy gets a great view of the ride. A leash hook is included in order to keep your dog secure during the ride. Front door features a clear plastic removable cover that can protect your dog during rain or windy times. Comes with a safety flag. A funky bike trailer, this one was actually made for transportation of babies. Weight limit is 40 pounds, making it good only for small to medium dog breeds. Bear in mind, it was not made for dog transport. Build quality is decent, as the trailer is made of durable rubber and steel. You get a weather shield and a bug screen. Thanks to the sturdy construction, you can easily pull along on your bike. Best part, you can fold it up nicely to fit in a small storage space. If you have a large dog, this trailer is the best one. Yes, some might excel in certain features, but this one does a great all around job. 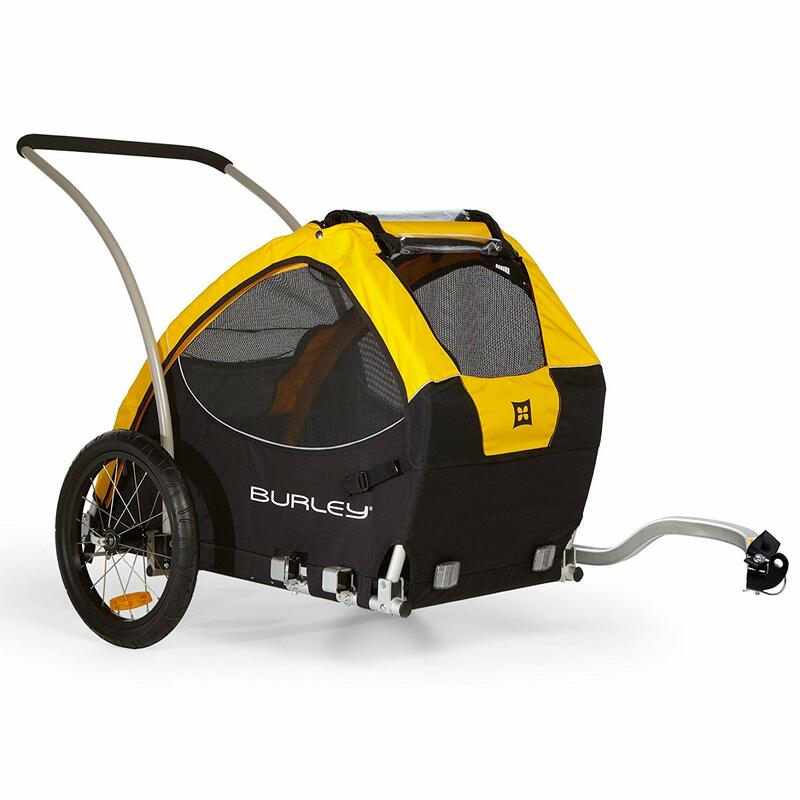 With a rugged build and extra features, the Burley trail wagon is safe to transport even larger dog breeds. One downside, there is no internal leash, but there is a good leash holder. Some of the nifty features include extra pockets, as well as a removable floor for easy cleaning. Comes with a 2 in 1 cover. The 16 inches tires are some of the best on the market. Last, but not least, folds for easy storage. 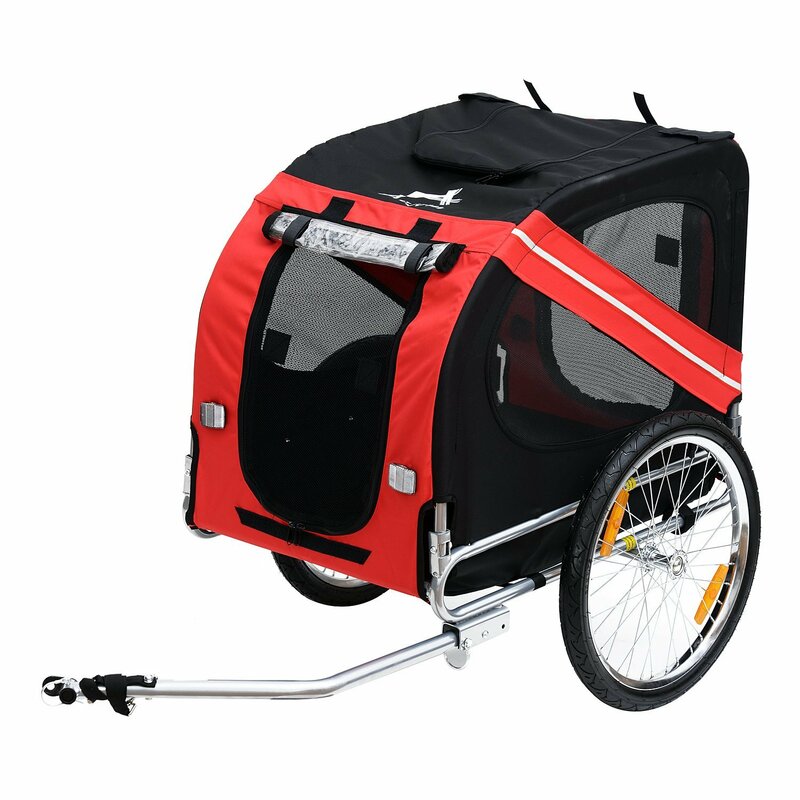 Designed to stand up on its back end, the Karmas Pet Bike trailer is extremely strong. And you can store it on its own easily. The weight limit is 60lbs, and you can even put two small dogs inside. Thanks to the multiple ventilation panels, you can be sure there is always air circulation inside. The trailer also comes with built-in front and back safety reflectors. Last, but not least, there is extra cushioning for a pleasant and convenient ride of your pets. This metal-framed trailer features a waterproof and flexible floorboard that will keep your pet dry and comfortable during the ride. With a collapsible design, you can easily store it when you are not riding. Features include adjustable safety leash that will keep your pet secure. Reflectors are positioned on the cabin and on each wheel, making sure you are visible. You can see this is a product made with a dog in mind. All of the safety and extra features are designed so that your pooch is comfortable and happy. Start from the doggie door, to leash, and much more. One downside, the weight limit is 50lbs. The doggie door is positioned on the back, which can be problematic for some dogs. However, some owners see it practical, as the dog can just jump in. Storage pockets are positioned on the sides, so that you can bring food, water, treats, and everything else for your puppy. If you want to go on long rides, this trailer will come in handy and make sure everything is smooth. With a weight limit of 110lbs, and large capacity, it can easily fit some medium to large dog breeds. The trailer comes in two versions. One is with a cargo rack on the top, and the other is without the rack. No matter which one you choose, you still get a good amount of cargo space, allowing you to carry more stuff. The best part is that it can easily convert into a stroller with a pre-purchased kit. Here is another trailer that can be easily converted into a stroller. The dual-purpose nature is why this trailer gets such a high grade. 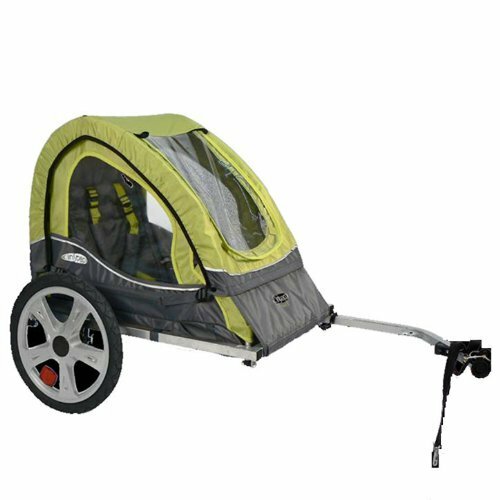 Featuring a lightweight steel frame and water-resistant polyester shell, the trailer keeps your pet safe. In the same time, you can be sure your pet is protected from rain, wind, and other elements. Unlike other convertible models, this one comes with a third wheel included for a stroller mode. The best part about the trailer is that it has two doors. The dual door design allows your pet to easily enter and exit, either from front or back. When not in use, safely keep it in place with the hand-lock brake system. You can say this stroller is designed for older dogs who still want some action in nature. All of the features are specifically designed so that an elderly dog can easily get in and enjoy the ride. For starters, the platform is very low, so that your dog can hop in. The inside is generously padded, and comes with an extra pillow for more comfort. Windows on all sides make it possible for the dog to watch what is happening outside as you bike around the city. No matter if your dog sits or stands, he can see everything around it. As we said, perfect for elder dogs, and dogs with joint pain and other health issues. 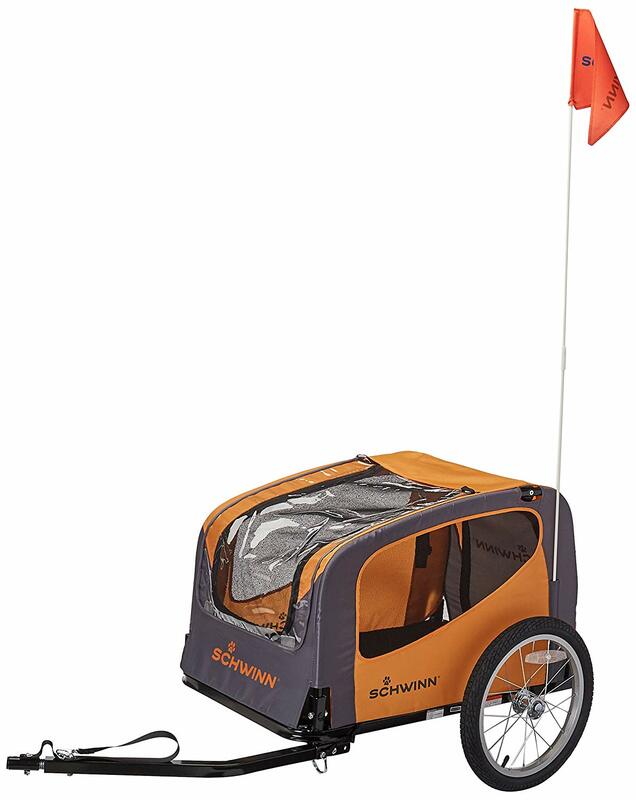 If you are working on a budget, and you still want to get the best dog bike trailer available, this one might be the one. While it is not the best all-around trailer, it is still a pretty decent option, and a cheap one as well. With a huge cabin space, and high weight limit, even a larger dog will be comfortable inside. Bonus points, the cabin is a square shape, allowing your dog to sit at the front or the back of the trailer. With 20 inches pneumatic tires, this trailer can easily go on slightly rougher surfaces like gravel trails. 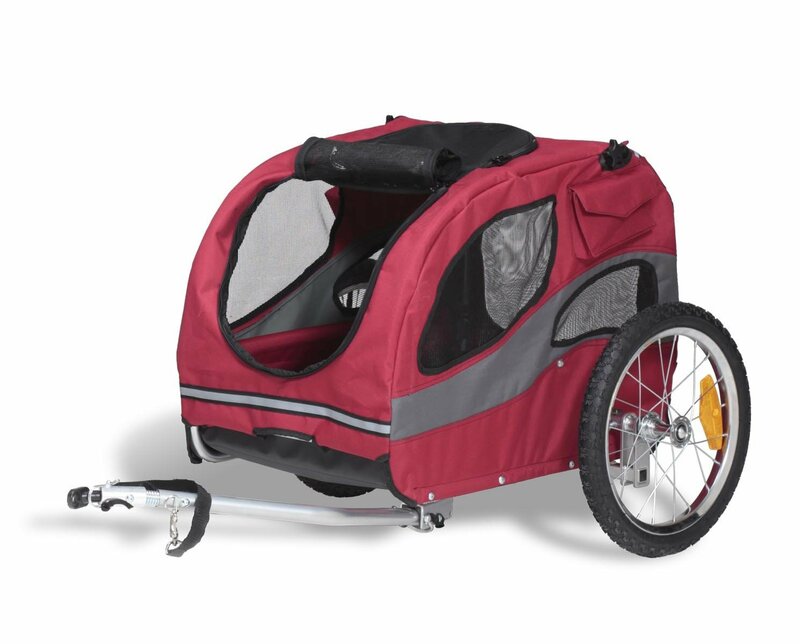 You can ride with the top unzipped, allowing your dog to get some fresh air.